On the icy cold night of January 10, 1899, students of Illinois Wesleyan University, in the small Midwestern town of Bloomington, had just returned from the Christmas holidays when Joseph L. Settles went to the room occupied by James C. McNutt and Clarence A. Mayer at 504 East Locust Street to discuss the organization of a new society on campus. Joined immediately by Owen I. Truitt and C. Roy Atkinson, these five students created the first set of regulations for the Knights of Classic Lore, a society whose avowed purpose was "to aid college men in mental, moral, and social development." ​"But if we keep Tau Kappa Epsilon intact, the Teke spirit…will flow on forever... Let us not lack faith in this project. Remember faith as a grain of mustard will overcome mountains of difficulty. The history of other organizations lends us encouragement. Phi Delta Theta was born a few years before the Civil War in a student's room in a building of Miami University, less pretentious than the preparatory building on the Wesleyan campus, and today Phi Delta Theta is the fourth largest fraternity in existence..."
The installation of Nu chapter at the University of California marked a significant step in the history of Tau Kappa Epsilon, a step that was taken only after considerable discussion and misgiving. The Sequoyah Club at the University of California had presented two earlier petitions that were turned down because of the distance from the 12 chapters that were then concentrated in Illinois, Iowa, Minnesota, and Wisconsin. The third petition, however, proved successful and TKE took a long leap geographically, obtaining a foothold on the shores of the Pacific. Phi Omega, a local fraternity at Washington University in St. Louis, was granted a charter as Xi chapter at the Minneapolis Conclave. Frater Reeve presided over the 14th Conclave in Cedar Rapids, Iowa. It was during this Conclave, in 1922, that hazing in fraternity initiation and pledging activities was soundly condemned. The 15th Conclave was held in St. Louis from October 24-25, 1923. Phillip H. McGrath was elected Grand Prytanis. In 1941, Grand Grammateus Tex Flint resigned his office after twenty years of service. Although Frater Flint first housed the central office at his home, he had moved the office into a new building in Lombard, Illinois, in 1927 and maintained it there until 1941. After Frater Flint's resignation, Past Grand Prytanis Lyle Straight was elected Grand Grammateus and the National Office was moved to Bloomington, Illinois. Three new chapters were installed during this period, with Alpha-Chi chapter at the University of Louisville being the last pre-war charter. 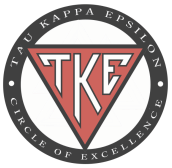 ​Frater Williams, however, held steadfastly to the belief that Tau Kappa Epsilon was constructed of a fiber that would not only survive the crisis, but would be the leader in the fraternity world in the years to come. ​James C. Logan, a Kansas City attorney, was elected Grand Prytanis at the 27th Conclave held during September 1953, at the Hotel Savery, Des Moines, Iowa. During Frater Logan's two-terms in this office 44 new chapters were installed, and a national housing fund was established to provide loans to undergraduate chapters for the construction and purchase of fraternity houses. During the 28th Conclave at the Hotel President and Municipal Auditorium in Kansas City, Missouri, Frater Logan was re-elected Grand Prytanis, and the corporate seal used on charters and certificates was officially adopted. In 1960 Bruce B. Melchert became Executive Director, and the fraternity office, or International Headquarters as it is appropriately known, was moved to Indianapolis, Indiana, the following year. The International Headquarters building in Indianapolis contains the offices of the Executive Director, the administrative staff, and the files, records, and equipment of the Fraternity. Among the many new dimensional goals formulated was the establishment of a TKE placement service to aid Fraters in obtaining employment. The 32nd Conclave, held in August 1963 at the Marrot Hotel in Indianapolis, marked the election of J. Russel Salsbury as Grand Prytanis, and the dedication of the International Headquarters building. The Teke Scholarship Fund, Inc., a not-for-profit, tax-exempt 501(c)(3) public foundation merged with TKE to form an educational foundation. Chapter Advisor Conferences came into being in 1969 to give more information to Fraternity advisors. Believing that the Chapter Advisor is a "key man for success," a number of services were directed toward preparing the Chapter Advisor for his responsibilities with the chapter. In 1970 TKE reached another significant milestone with the installation of our 300th chapter (Nu-Mu) at the University of South Alabama. ​Our 43rd Conclave was held in Orlando, Florida, where many Fraters enjoyed "TKE Day" at Walt Disney World. Joel E. Johnson was installed as Grand Prytanis and the "America's Fraternity" theme campaign was introduced. The Order of the Golden Eagle was given posthumously to Frater Harry J. Donnelly, who is generally considered a founder of the TKE Educational Foundation. In 2003, TKE held its 52nd Conclave at the Omni Mandalay Hotel at Las Colinas in Irving, Texas and Mark C. Romig was elected Grand Prytanis. Life Loyal Teke was unveiled as the newest Fraternity program.